.. . EDUCATION FOR PEACE .. .
It’s the true story of an awakening. It traces the path of Edward Snowden’s career in the U.S. military, the CIA, the NSA, and at various contractors thereof. It also traces the path of Edward Snowden’s agonizingly slow awakening to the possibility that the U.S. government might sometimes be wrong, corrupt, or criminal. And of course the film takes us through Snowden’s courageous and principled act of whistleblowing. 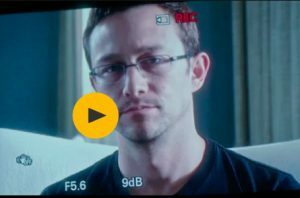 We see in the film countless colleagues of Snowden’s who knew much of what he knew and did not blow the whistle. We see a few help him and others appreciate him. But they themselves do nothing. Snowden is one of the exceptions. Other exceptions who preceded him and show up in the film include William Binney, Ed Loomis, Kirk Wiebe, and Thomas Drake. Most people are not like these men. Most people obey illegal orders without ever making a peep. And yet, what strikes me about Snowden and many other whistleblowers I’ve met or learned about, is how long it took them, and the fact that what brought them around was not an event they objected to but a change in their thinking. U.S. officials who’ve been part of dozens of wars and coups and outrages for decades will decide that the latest war is too much, and they’ll bail out, resign publicly, and become an activist. Why now? Why not then, or then, or then, or that other time? These whistleblowers — and Snowden is no exception — are not passive or submissive early in their careers. They’re enthusiastic true believers. They want to spy and bomb and kill for the good of the world. When they find out that’s not what’s happening, they go public for the good of the world. There is that consistency to their actions. The question, then, is how smart, dedicated young people come to believe that militarism and secrecy and abusive power are noble pursuits. Oliver Stone’s Ed Snowden begins as a “smart conservative.” But the only smart thing we see about him is his computer skills. We never hear him articulate some smart political point of view that happens to be “conservative.” His taste in books includes Ayn Rand, hardly an indication of intelligence. But on the computers, Snowden is a genius. And on that basis his career advances. What are some good films and videos that promote a culture of peace? Snowden has doubts about the legality of warrantless spying, but believes his CIA instructor’s ludicrous defense. Later, Snowden has such concerns about CIA cruelty he witnesses that he resigns. Yet, at the same time, he believes that presidential candidate Barack Obama will undo the damage and set things right. How does one explain such obtuseness in a genius? Obama’s statements making perfectly clear that the wars and outrages would roll on were publicly available. I found them with ordinary search engines, needing no assistance from the NSA. Snowden resigned, but he didn’t leave. He started working for contractors. He came to learn that a program he’d created was being used to assist in lawless and reckless, not to mention murderous, drone murders. That wasn’t enough. He came to learn that the U.S. government was lawlessly spying on the whole world and spying more on the United States than on Russia. (Why spying on Russia was OK we aren’t told.) But that, too, wasn’t enough. He came to learn that the U.S. was spying on its allies and enemies alike, even inserting malware into allies’ infrastructure in order to be able to destroy things and kill people should some country cease to be an ally someday. That, too, was not enough. Snowden went on believing that the United States was the greatest country on earth. He went on calling his work “counter cyber” and “counter spying” as if only non-Americans can do spying or cyber-warfare, while the United States just tries to gently counter such acts. In fact, Snowden risked his life, refraining from taking medication he needed, so that he could continue doing that work. He defended such recklessness as justified by the need to stop Chinese hackers from stealing billions of dollars from the U.S. government. Apart from the question of which Chinese hackers did that, what did Snowden imagine it was costing U.S. taxpayers to fund the military? Snowden’s career rolled on. But Edward Snowden’s brilliant mind was catching up with reality and at some point overtook it. And then there was no question that he would do what needed to be done. Just as he designed computer programs nobody else could, and that nobody else even thought to try, now he designed a whistleblowing maneuver that would not be stopped as others had. Consequently, we must be grateful that good and decent people sometimes start out believing Orwellian tales. Dull, cowardly, and servile people never blow whistles.